Looking For THE Best Way to Grow Your Blog? No matter where you are in your blogging career, sometimes you just can’t get the results you’ve worked so hard for. You follow all the steps, read 1000 guides and try 100 new things – but nothing is lifting you up. You’re stuck in a rut, and you can’t quite find that boost to get you out. We're here to change the way you blog, forever. SEO Superheroes is the BEST investment you can make in your blog. We’re here to help you reach your full potential - one step at a time! The sky’s the limit, and once you keep growing, you never stop! The possibilities are endless, all you need to do is get started. Your blog posts (the ones you’ve worked SO hard on) could be hidden from THE BIGGEST source of traffic around - meaning thousands of potential readers are left out in the cold, unable to find your content when they need it most! And we don't expect you to go it alone - we're here to give you step-by-step, start to finish advice on how you can properly optimise and target your content for best results. How to get in front of your ideal readers. How to SKYROCKET your traffic. And we're here to help with beginner friendly, blogger specific classes (plus a WHOLE heap of bonuses) to help your content be SEEN by Google, and performing better than ever! Getting you out of that rut, that slump, that UGH feeling is what we do best. Well, that and SEO – Search Engine Optimisation. It's a topic that won't win a beauty pageant anytime soon, but will quickly win your heart. Instead of getting stuck on what SEO is, focus on just some of the AMAZING results you can unlock with the power of SEO. Say Goodbye to Blogging Slumps. No more bad days, no more feeling hopeless. Only positive results, and meaningful growth. We’ve seen countless bloggers unleash the FULL power of their blogs with just a few tweaks. A change here, an optimisation there. Then BOOM – readers up to their eyeballs. Money coming out their ears. We wish we were kidding, but we aren’t. You’ve tried everything under the sun. The Facebooks, the Pinterests, the annoyingly un-chronological Instagram. Places you KNOW your readers are, but they’re just not biting. Social media is a double edged sword when it comes to effectively and consistently growing your blog. You’ve created informative posts you KNOW your readers will love. You’ve pinned, shared and posted across every corner of the web, but those pesky social media algorithms are holding you back. Holding you back from reaching your BEST readers, and limiting your potential! It’s time to shift your focus away from platforms you don’t own – Facebook, Pinterest, Instagram, and whatever the teens will be flaunting next. Forget them. Focus on what you do own. You! Okay, well more your blog, but it’s really an extension of yourself isn’t it? Stop investing in someone else's platform, and start growing your own site instead! As a blogger, one of your most important metrics is traffic to your site. Whether it's simply tracking your latest post's performance, or pitching for a guest post or sponsored opportunity, it's hard to get anywhere unless people are coming through the door! With bloggersSEO, SkinnyMixers DOUBLED their traffic following the techniques inside this very course. After creating a highly engaged, devoted community with a wealth of posts behind her, Nikki of skinnymixers.com was ready to take over the world. She was doing everything right but was still unable to reach that next level of ultimate success. With bloggersSEO, Nikki added an extra 200,000 visits PER MONTH to her blog - purely from Google organic traffic. That's 200,000 people who LOVED what Nikki had to offer, but simply couldn't find her content before! As good as our team is at Photoshop, even we couldn't fake something this great - below is a screen grab from SkinnyMixers Google Analytics account. 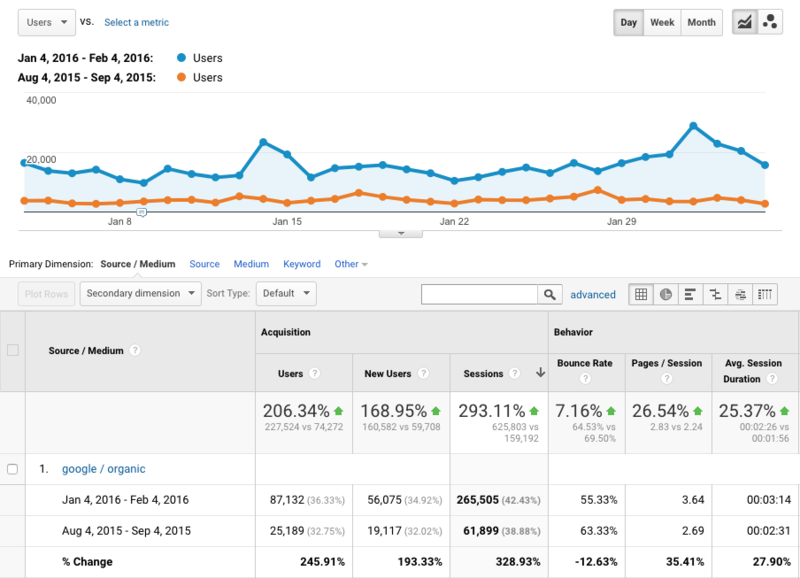 Check out the difference in traffic before SEO and after SEO. Notice how her daily visitors have DOUBLED already, and are STILL steadily on the increase? THAT'S the power of SEO. Now, besides from a few SEO changes, Nik just kept on doing what she did best. She nurtured her community as per usual and kept creating great content. She didn't empty her wallet for Facebook ads. She didn't spend hours on Instagram pods. She didn't even have to create anything new. All Nik did was improve what she'd already created - a tweak here, a change there. 200,000 extra visits per month. 60,000+ new readers. The Support You Need, Every Step of the Way. Don't go it alone - with our all-inclusive course AND a dedicated team waiting right here to help you, you'll be the star of our #SuperSquad in no time! Ready to See the Same Results? Jealousy-inducing growth is only a few clicks away. No Magic and No Gimmicks - Just Great Content, Optimised. Before joining our #SuperSquad, Nikki was leaving 60,000 EXTRA readers out in the dark. That's people who wanted EXACTLY what she had to offer, but couldn't find her amazing content when they needed it most. So what happened? Just HOW did Nik pull that many extra readers out of thin air? The truth is, those readers were ALWAYS there. Before bloggersSEO, Nik was sending 60,000 new readers into the arms of competitors - those with stronger sites, who ranked higher. She was virtually invisible biggest source of traffic around. Google. After bloggersSEO? Nikki CLEANED the field, wiping her competitors off the map and even out-ranking the brand she blogs about. Learn the ropes with our essential introduction classes. YoastSEO is a popular WordPress plugin designed to simplify basic SEO processes, while still allowing for in-depth configuration. Avoid Google's 'NOT SECURE' warnings on your blog - secure your user's data & improve UX with HTTPS. Once you've got the basics down, it's time to explore new opportunities and break down the nitty-gritty issues that are holding you back! Gain a clearer understanding of your site’s functionality and relationship with Search Engines. Discover & repair areas to improve the overall health of your site. Fast sites have higher rankings; lower bounce rates and longer browsing times. Learn how to analyse your site’s speed and make improvements. Google Analytics allows you to find out who's coming to your site, how often, where from, and WHAT they're doing on your site. Search Console's inbuilt organic search monitoring allows you to track the performance of phrases & landing page. Learn how to identify new sources for growth. Are you being held back by old SEO techniques? Consolidate content to improve UX, build your authority and improve rankings. Extend the lifespan of each and every post on your blog. Improve your audience's experience on your site, increase content views AND improve your analytics stats. Your site’s theme holds everything together - it’s a combination of branding, styling and purpose - but is it delivering what you need it to? Your site could be missing a lot more information than you think. Quickly find & fill the gaps for maximum performance. Just getting started? There is NO better time to learn SEO than when you've got your WHOLE career ahead of you! Build a strong foundation from the get-go, and see maximum results right from the start! If you're not even sure what SEO stands for or aren't familiar with the technical side of your site, THIS is the course for you! Our team guides you through each topic, action and change step-by-step - no prior knowledge needed! Looking to sharpen your edge? If you've already built an audience and have a bank of posts behind you, it's time to maximise your performance and rapidly expand your audience. We've left NOTHING to chance - SEO Superheroes is our most comprehensive course yet, covering a staggering 79 concepts & techniques over 15 areas of your blog! Write For Your Reader, NOT Google Why We DON'T Build Backlinks Black Hat SEO - The Bad, The Ugly and The Outdated. The brains behind everything bloggersSEO, Jim has over 20 years in the industry testing, experimenting and developing the techniques we share with you. Prone to going on tangents and finding something you didn't even KNOW was wrong, Jim has helped countless sites across the world see the results they really deserve. Joining the team in 2016, Liz takes on many roles at bloggersSEO, helping bloggers all over the world realise their dreams with SEO. Her main task is really wrangling Jim, syphoning valuable SEO skills out of his brain and delivering them to bloggers who need them most. Can we just say Jim 2.0? With nearly 10 years of experience under his own belt, Nick is a power-house of SEO knowledge in his own right. A favourite amongst the lady-bloggers, Nick provides additional support to our community. Take the Plunge, See the Difference. A whole world of new blogging techniques, right at your fingertips. Sure, if you want an answer that could potentially HARM your growth! Your blog is as unique as you are - and it takes the expert touch to know exactly which processes will have the biggest impact and the best results. Plus, we've spent the last 20 years trying out and perfecting techniques (and throwing out the bad ones) so you don't have to! If you need help, our dedicated team is already waiting to answer your questions! With an in-built course discussion area, EXCLUSIVE community group AND a direct line to our team ([email protected]) you'll have all the support you need, every step of the way. How long can I access my course & support? SEO Superheroes comes with LIFETIME access to all course materials - plus, all future updates and additions will be included, for free! Meaning you'll constantly be able to grow and learn as the industry changes! As long as bloggersSEO is still around, we'll be right here to help you out - and trust us, we ain't going anywhere soon. Do you offer returns or guarantees? bloggersSEO proudly offers a 14 day money back guarantee on all our products - no questions asked! When we say SEO Superheroes is value packed, we mean it! SEO Superheroes is our most comprehensive course yet - and includes ALL our other courses and offerings, FOR FREE!